Welcome to my website! I decided to start this website in order to share what I have learned about 'The Craft'. Some may be familiar with a Spiritual path called Wicca. 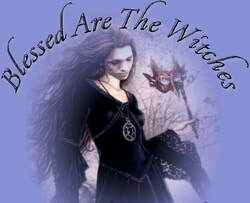 I am not Wiccan, but I am a Pagan,eclectic,hereditary witch with Celtic leanings. I have learned some things from my family and some things from other witches that I respect who maintain and teach through websites like this one. My purpose is to share what I know with you, assuage your curiosity, and perhaps help you get connected to the resources that you need to begin, or advance your own study of The Craft, as we like to call it. I hope you enjoy my site! ​In real Witchcraft, there are no rules. Morality and ethics are situational and dependent upon the culture, upbringing, and personal philosophy of the Witch. There are times, such as when danger is imminent, that the Witch must take defensive action. It is not evil to protect yourself, your family, and your community. The competent Witch learns to work within the balance of nature and the tides of magic. A Witch's spirit bows to no one. As a Witch, you claim your own power to do what you choose, serving no master but your own will. Witches do not discriminate against other faiths, but rather honor the paths by which we all advance our spirituality. The magic practiced in Witchcraft is very much akin to the magic of the crone who lives in her cottage in the woods. It uses spell-casting,charging of objects as charms,and the concoction of potions, to name a few techniques. It is an Earth based practice, using the Elementals - Earth, Air, Fire, and Water energies for creative assistance. Sometimes it calls on magical beings such as faeries, sylphs, dryads and elves and the cycles of the Moon to help manifest change. To do a planned ritual or to ritualize on a whim under the light of the Moon, under a starry sky, in the woods, on the beach, by a river, or under a particularly beautiful tree makes me feel connected to the power of magic. I love to smell the wind for signs of things to come. I connect to and receive Blessings from the Three Realms of the Sacred Land that supports me, the Eternal Sea that surrounds me, and Endless Sky above me. I am a Sister of Avalon, a Priestess, a Healer, one who loves. This is what I believe and this is my basis for my practice of Witchcraft. I believe in magic! ​Most practitioners of The Craft, that I am familiar with, are spiritual people. Some embrace a mainstream form of religion and fit their Craft practices into it. Others believe in a Divine Universe with some sort of 'Higher Power' or Source of All in charge. Some believe in connecting only to Mother Earth and the Elemental Forces of Earth, Air, Fire, and Water who work together to form our physical environment. Dr Newton is a hypnotherapist who has compiled fascinating case studies of clients who have reported about past lives, deaths, and time spent between lives in the soul world prior to reincarnating once again. Yes, I believe in reincarnation! One of the fascinating things that Dr. Newton reveals is that we are not the only world in the Universe and we may chose to reincarnate on many different worlds at different times. These books are fascinating reads and I can't recommend them highly enough! In my opinion, they should be mandatory reading for every soul that comes to Earth. Knowing the information in these books would certainly help to increase brotherly love and decrease much of the anxiety of living in a world full of challenges! ​I am also a Sister of Avalon.​* I joined this Tradition 3 years ago and I can't say enough about how supportive and kind my Sisters are. ​To give you an idea about who we are, below is an excerpt from the introduction of the main 'textbook' of the Sisterhood: Jhenah Telyndru. Avalon Within: A Sacred Journey of Myth, Mystery, and Inner Wisdom (Kindle Locations 83-84). Kindle Edition. She stands in the prow, her form cloaked by dark robes and clinging mists. Her voluminous hood conceals her age-she could be anyone's daughter, sister, or mother. Her foothold is sure, her body steady. Through the thickening mists and fitful waters, she stands firmly in her place and ever-certain of the way; she has conquered this lake and parted these mists to find her way to Avalon. Now, in service, she guides others through what appears to be the impenetrable, until they too can arrive at the Holy Shore unaided. She is a Priestess of Avalon.